Update: It looks like some signals got crossed. This is the Sony Xperia Z1 Compact - the "Z1s" is a T-Mobile branded variant of the original 5-inch phone. It's been said that those who want a powerful modern smartphone with a non-gigantic screen don't have a lot of options. If a new post from the tireless Evleaks is to be believed, they'll have at least one more on T-Mobile very soon. 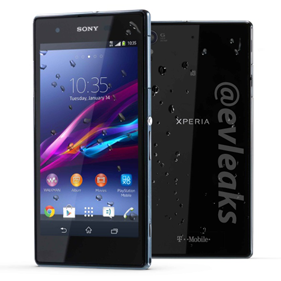 The Sony Xperia Z1s (possibly the Xperia Z1s - note the superscript) was shown off in a recent post along with a full set of specifications and a T-Mobile logo. The phone purportedly uses a Qualcomm Snapdragon 800 2.2Ghz quad-core processor, 2GB of RAM, 16GB of internal storage, and the same impressive 20.7 megapixel rear camera as the Xperia Z1. But what's more interesting is the 4.3" screen. It's only 720p resolution, but with a screen size that small and Sony's impressively sleek industrial design, this should make for a tiny smartphone compared with similarly-equipped models. Other reported specs include a 2MP front-facing camera, a 2300mAh battery, and Android 4.2 with Sony's customized skin visible in the photo. There is no date or price information available at the moment, though Evleaks does note that this T-Mobile model is intended for a 2014 release. The body style looks typical of Sony's design language going back to the original Xperia Z, and the water droplets indicate that it's at least somewhat waterproof like other premium Sony models. With those specs, the Xperia Z1s will probably demand a higher price than other 4.3" phones, but it will be well-justified. We'll be looking out for this little guy at Sony's CES event, where they might show it off for the American market. If not there, Mobile World Congress in February would be the next likely venue.